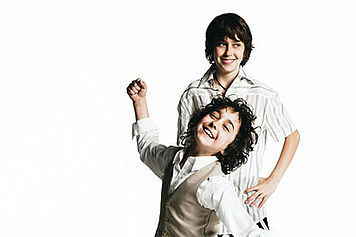 This family act started when Polly Draper (an actress best known for her work in the TV series thirtysomething) created, wrote and directed a movie centered around her two musical sons Nat and Alex Wolff. Filmed as a mockumentary, the film spun off a Nickolodeon series by the same name. Both the film and the series spoof the trappings of celebrity, chronicling the kids as they make music, cope with fame and battle addictions to soda pop. Dad (and former Arsenio Hall Show bandleader) Michael Wolff also produces the show. But most remarkable are the young brothers: Nat actually does write the songs, which are performed by himself, his little brother Alex, Cole Hawkins, Allie DiMeco, Joshua Kaye, Thomas Batuello, and David Levi. The songs are quite catchy, and the boys sing, it has to be said, beautifully.